Dust settles on upholstered furniture just as on hard surfaces, and should be removed regularly, about once a month, depending on environment and use, with vacuum cleaner attachments--the upholstery nozzle and crevice tool. A brush will remove some dust if you do not have a vacuum, but will also scatter dust around. However, down-filled cushions that are not lined with down-proof ticking should be brushed as vacuum may draw out down. Reduce greasy soil in air by use of range hood when cooking; clean furnace filters reduce soil in air. Arm and headrest covers of matching or harmonizing fabric protect those areas against early build-up of soil from skin and hair. In summer, if people will be sitting on furniture in shorts, cover with washable throws, sheets, or large pieces of terrycloth to protect from body soil. When cleaning upholstery always test upholstery in an unnoticeable area by spraying Clean-n-Brite and agitating with a soft brush and lightly scrubbing. If the cleaned area looks the same but cleaner, the entire piece of upholstery may be cleaned in this manner. Steam Clean or Shampoo only a small area at a time and use a sponge or cotton rag to wipe and dry surface areas. When Shampooing repeat if necessary, then wipe area with a clean cloth dipped in clear water and wrung nearly dry. Tips: For quick drying, open windows or turn on an electric fan, a dehumidifier, or an air conditioner in the same room. Most upholstered furniture sold today has a label or tag telling how it should be cleaned as explained under "Fabric Cleaning Code Labels". Follow those instructions for best results! Clean-n-Brite will remove dirt and oil build up on any surface instantly. It comes right off! 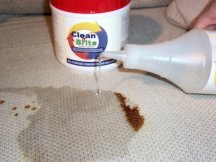 Carpet dirt, grime, and stains will disappear with the powerful cleaning action of this product.